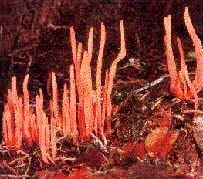 This fungus is also known as the Devils Dipstick and the Dog Stinkhorn (Mutinus caninus). It can be seen as a solitary fungus or clustered with others on the ground or rotten wood in gardens, roadsides, woods, etc. It is not poisonous and although the mature specimens are hardly tempting, the eggs are supposedly quite tasty when peeled and rolled in flour seasoned with garlic, salt and pepper, dipped into beaten egg and then re-rolled in the flour mix before frying in butter and oil. This may be served with crackers and cream cheese. It begins as an egg up to 2.5 cm high, has white skin or sometimes a faint pink or yellow tinge, with an inner gelatinous layer rupturing to form a volva at the base of the stalk. The mature fruiting body is 5-10 cm high and 0.5-1.2 cm thick. It is unbranched, roughly cylindrical and slender, and has no differentiated cap. Instead it has a blunt and often perforated tip. The fertile portion covers the upper 2-3 cm of fruiting body (apart from the very tip) and is bright orange-red to pink in colour. At first it is covered wit olive-brown spore slime. The roughly equally narrow stalk, the same colour as the cap or a little paler, is hollow, fragile and spongy (minutely chambered). It lacks a veil (indusium). The spores are 3-7 x 1.5-2.5 microns, elliptical or oblong, and smooth. Mature specimens can have a unappealing smell, but it is probably not as bad as other types of Stinkhorns. In Oregon, a completely white variety of this species has been found, although it may in fact be a distinct species itself.